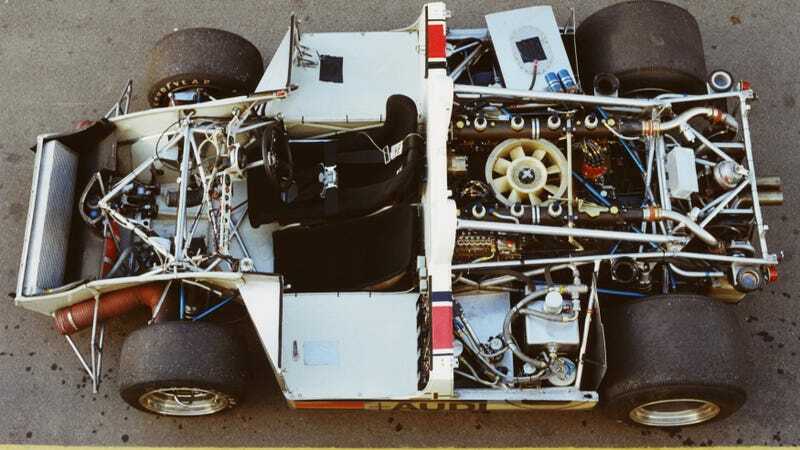 A Porsche photo of a different 917/10 chassis. One thing to know about the Porsche 917, the top-rung prototype that went from beating Ferrari at Le Mans to beating McLaren at CanAm: The pedal box sat ahead of the front wheels. That is to say, if you crashed, your feet were your crumple zone. Keep that in mind as you watch Porsche super-restorer Bruce Canepa wheel a 917/10 CanAm car around Laguna Seca during Rennsport last weekend. CanAm was close to an unlimited series, so teams could run basically whatever the hell they wanted. Most people stuck American big block V8s into skinny tube frame cars with big wings and called it a day. Porsche spent more and twin-turbocharged their existing 917 and its flat-12, after a brief but intriguing tryout of a flat-16. In any case, Porsche clobbered the series to the point that it pretty much killed off CanAm, a program so successful it won itself out of a series. What’s funny watching the video is how, I don’t know, calm it all sounds. Porsche 917: Happy Birthday, Turbopanzer!